Kid Kingdom is St. Michael's version of Sunday School for kids Pre-K through Grade 6. 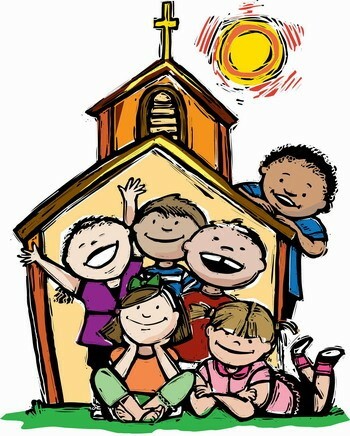 Children go to church with their families and leave for Kid Church to St. Matthew's Room when announced. Children will be absorbing Bible stories through the use of Godly Play, an engaging method where small props are used followed by a time for the children to "wonder" about the story they just experienced. Other appealing activities are interspersed such as prayer, songs, and related crafts. Kids rejoin their families for Communion. Kid Kingdom is on vacation during June, July and August. There are several activities throughout the year especially for children, including the Christmas Pageant, Easter Egg Hunt, Handbells and other musical offerings. Some parish events also offer free childcare. The form to register children for Kid Kingdom is in the sidebar at right under "Resources." All persons working with children in our parish have completed Safeguarding God’s Children training.